In the midst of my extreme pain, I found your website and comfort. I am a recovering alcoholic, sober for 25 years. My son is in the midst of heroin addiction and dealing drugs. Last week I had to put him out of my home. I am walking by faith daily, knowing that I am not in charge of this man’s life. He is 25 now, but has been doing drugs I think since his early teenage years. This is not something I ever imagined for his life or mine. Your website on advice to parents gave me much comfort and I bought your book. I am requesting the study guide if possible. I am an Episcopalian and I know that my God is steadfast from my own journey. Facing His will for my life and my son’s, however, is frightening to me. Yet, I know God’s will is perfect. I mean I know this in my heart. Yet I continue to think the worst. I do ask your prayers for both of us that we be lead from this darkness into the light. I am most sincerely grateful for your deeply healing life narrative and the guidance it contains. Thanks so much for letting me know my words have helped to bring comfort. Please do get the support you need to face this extraordinary challenge. Your faith in God will be tested but will be strengthened by going through this test. Keep your heart open, get support to feel your pain, set your boundaries and release your son to God’s hands. Remember he is God’s son also. And PRAY a lot. I hope you also seek the support of Al-anon or Families Anonymous. I could never have made it without Al-anon. Attached is the Study Guide. If you want, let me know your response to reading the book, and let me know how your story with your son unfolds. You will be in my heart and in my prayers. Thank you for your kind words. I am doing the things you suggested. I have released him to God as I believe in my soul this is a spiritual journey that Jack must walk out. As you well know the pain has been searing and at times I have thought I just want out of this vale of tears. I looked inward through meditation and prayer. From your web page I found out what I think I already knew in my soul, but did not want to face – this is my spiritual journey as well as Jack’s. Your confirmation allowed me to embrace what is. And, Susan, in reality you provided a sounding for me, which centered me and …not sure how to express this idea…but provided some sort of peace within me in the midst of this overwhelming chaos. The phrase “my God is steadfast” has centered upon my heart or that is where I feel its presence at any rate. Thank you for releasing your journey into our shared experience so that the many coming behind you may experience the light in the darkness. Posted in General Interest	| Comments Off on Help is available! If you would like to leave a comment here, please first read Love Unbroken so that we have a basis for discussion. After reading the book, leave me a comment with your real name and a working email address, and then I would be happy to engage in dialogue with you. For those who followed my dialogue with Luis from Madrid, Spain, about our family’s use of ayahuasca in our healing from the family disease of addiction, he has written “But in the end, Ayahuasca is also an expression of God or Goddess, so why not?” Luis would like to get connected with the Pathwork in Madrid, and I wish him the very best on his path, hoping that the connection I have forwarded to him may prove fruitful for him. Blessings on the path! Thanks for writing back. I understand your concerns about psychological dependence on altered states as a way to avoid the external reality of life. I too have seen this, in the Santo Daime church and, of course, elsewhere. My point is only that the use of mind-altering drugs is a complex issue, not easily resolved by familiar dualistic thinking. The Pathwork Guide often says that no action is in itself good or bad, it depends on many factors, most notably intent. Just as I have seen people “stuck” in the Santo Daime church, I have also seen people “stuck” in the Pathwork. The Pathwork can, inadvertently, encourge recycling process work because it is the known path. This can never take one to a different level of reality, which can only be entered if the known path is released and the unknown is embraced. As long as you think you know what reality is, the deeper truth of life will elude you. As long as one looks through any particular lens, that lens will define and limit what one sees. Eventually one outgrows any path, since a path is based on a specific world view, and life itself has no world view about itself. It just IS itself. And we are THAT. So, sooner or later, one awakens from any path which attempts to lead the seeker toward the reality of what we are. Instead, we awaken to that toward which all paths are pointing. And that is the end of seeking, and the end of identifying one’s “self” with any path. I love the Pathwork and the wonderful work it does with many people. I support the Pathwork at Sevenoaks and occasionally still participate in Pathwork events. I have deep, wonderful, life-long relationships with many friends who are Pathwork helpers and students. I also have deep, wonderful, life-long relationships with many friends who are committed to the path of the Santo Daime, though I no longer participate in the ceremonies. I do not judge my friends on the basis of what path works for them. I am happy that they have found a path that works for them. But at this time in my life I no longer feel a “part of” any particular path; it simply is not true for me now. No one knows what the future will bring! loved the Susan of “the undefended self”. Now I’m confused. I note that you have not finished the book Love Unbroken. The final third of the book hardly mentions ayahuasca, so I don’t think it is fair to say the book “recommends ayahuasca.” I invite you to read the “Disclaimer” at the end of the book which specifically states why I do NOT recommend ayahuasca to anyone. Nonetheless, I appreciate very much your writing your concern about Love Unbroken. You have given me an opportunity to address a concern which I expect many people share. Your confusion about ayahuasca and drugs is very understandable. Many people think the way you do – that all mind-altering substances are the same and are all bad, especially for people on a spiritual path. However, the subject is much more complex than that. As the Pathwork Guide and all spiritual paths teach, life is not dualistic, with things being simply good, or simply bad. I would advise that, before you believe the culture’s ideas on the subject of drugs, you investigate a little more deeply. You might begin with the book that a well-respected American physician, Dr. Andrew Weil, wrote many years ago called From Morphine to Chocolate. He points out that many substances—from morphine to chocolate and including alcohol, nicotine, and caffeine—have mind-altering properties. It’s just that some of these substances have become so ingrained in the conventions of our society now that we don’t think of them as “bad” the way we do the “illegal” mind-expanding drugs. Dr. Weil also reminds us that many indigenous cultures used mind-altering substances in the service of contacting the spiritual realms. He writes about how the universal impulse for contact with something “larger” than oneself has been perverted in modern times into a drug culture where pill-popping is common and drug addiction rampant. Some drugs guarantee addiction: heroin, cocaine, meth-amphetamine, and alcohol taken in excess. Some drugs cannot readily be abused in this way: ayahuasca, peyote, and ibogaine are among them. Often abuse is a matter of context and intent: some psychedelics can produce very positive results (see the research at www.maps.org) but, if taken without adequate direction and positive intent, can be very destructive. The study of what is a “good” use of mind-altering drugs and what is a “bad” use is complex, and depends on intent and context. Research into this area is required so as not to simply reflect the prejudices of contemporary culture. And so, the US and most Western European governments codify conventional thinking by labeling all mind-altering or psychedelic drugs as VERY BAD, with no medicinal uses. And yet some governments, even in the United States (and of course in Brazil), recognize that some substances that might be “bad” if used carelessly, may indeed be “good” if used as a sacrament in a religious context. The US Supreme Court voted unanimously to approve the use of the ayahuasca sacrament in the context of a legitimate Brazilian church. I did not choose to use ayahuasca casually. My life situation was dire, and the Pathwork alone offered no solutions. The Pathwork does not deal with addiction, spirit possession or serious mental illness. Other avenues were needed. I was desperate for something that could break through my daughter’s despair and my anxiety. I had gone as deep as possible with the Pathwork. I lived “the undefended life.” I still do. But when “the undefended self” encountered the multiple challenges of addiction, spirit possession, and serious mental illness, I had to go outside the boundaries of conventional Pathwork for help. I went to 12-step programs for my own recovery from the family disease of addiction. 12-step programs deal effectively with addiction and, while they are “outside” the Pathwork, are certainly compatible with it. As a young teenager, my daughter was not ready for the work of the 12-steps, and certainly not for the work of the Pathwork. We took our daughter to many therapists, psychiatrists, and even to a residential treatment center where she was “incarcerated” for two years. Nothing worked. No amount of therapy, nor this behavior-modification boarding school, touched her deeper issues. And yet one experience of ayahuasca in the context of Santo Daime ceremonies in Brazil opened her up to the presence of God in a way that nothing else did. Once she had a palpable experience of the presence of God she knew that she was not hopeless. She and I believe that the Santo Daime saved her life by opening her up spiritually. Even though she still had to go through her addiction, until it was done, she would surely have been dead had she not carried in her heart the hope for liberation from addiction which the Daime visions gave to her. Later on Pam was ready for therapy and for 12-step work, but in the beginning of her descent into addiction, it was the Daime which gave her a glimpse of hope for a way out of her insanity. For myself, no amount of probing and releasing childhood images, buried feelings, or past life experiences or calling in my higher self healed my chronic anxiety. My life was nonetheless perfectly manageable and I was successful as author, teacher, and Pathwork helper until the challenge of dealing with and finding help for my daughter presented itself. That challenge crumbled my idealized image as teacher and mother and catapulted me into a search for somewhere my soul could rest, a place beyond all ego ideas about who I thought I was. Without this spiritual opening on my part, I could not have gone the distance in helping my daughter. Because of this shift in perception, I was enabled to sustain hope, to stand by her until she was ready for recovery. Something larger than my personal “higher self” had to come in, something beyond anything I found in the practice of Pathwork. That “something larger” came to me through the disciplined use of the sacrament of the Santo Daime. Could my healing and Pam’s have come some other way—sure, theoretically. Maybe we could have been knocked to the ground like Saul of Tarsus and received directly from Jesus Christ the “blow” to our former selves that opened up the possibility of radical transformation. But in our case, that blow to the ego self and that opening to radical transformation included the use of a psychoactive substance. It might have come another way, and I’ve often wished it had come another way. We have gotten a lot of negative response, in the U.S. and in Brazil, from Pathworkers who do not want to be associated with this path that we took. I have sympathy for that. The Pathwork is the Pathwork. The Santo Daime is the Santo Daime. They are different paths – each can work on the transpersonal level, but the methods are different. I have walked both paths. The Pathwork is in my bones – I practice compassionate observation every day, embracing all that arises in consciousness. I am open to feelings and do my best to process all emotional reactions so that my expression comes from a genuine place, not a reactive place. I practice deep authentic honesty with others (when they are open to it). For these practices I thank Eva Pierrakos and the Pathwork Guide. The connection to the Divine Mother is also in my bones. She is my mother, my teacher, my guru. And I am She. For this comfort and this awareness I thank the Santo Daime. I no longer call myself a Pathwork teacher and I no longer drink Daime. Both paths served me well, but I no longer identify with either path. It feels like they have completed themselves for me. Instead, now the day-to-day practice of awareness and compassion and honesty and, above all, surrender to and trust in each moment just as it is, are all that are needed to guide me. My “teacher” is my life. Actually life and teacher and “me” are just one stream of awareness and compassion unfolding flawlessly. I hope this has been useful to you. I am happy to continue the dialogue. If you want to hold on to the “Susan of The Undefended Self” feel free to do so! 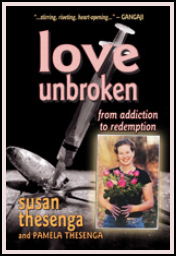 But if you want to know what it is like to meet a severe life challenge from the place of living from the undefended self, then read Love Unbroken. From this you may learn something about letting your heart be broken open and surrendering to the power of a love that is unbroken, unharmed, untouched by all our human dramas and heartbreaks. I can assure you that, sooner or later, awareness of this deeper love will come to everyone. How that unbroken love comes to you will be your path, not my path. I can only write about how it came to me. It’s Christmas Eve day—snowy, wet, cold. I’m missing Pam terribly. Christmas was always a time of closeness in our family. No matter what else was going on, Pam would warm to us on this special day. Tonight I’m determined to have a little Christmas spirit with what’s left of my family. I’m at my ninety-two year old mother’s house, but neither she nor my husband Donovan seems to care about having a Christmas tree. I’m adamant. I’ve asked Donovan to bring up from our house some of our Christmas decorations, including the lights which go on the tree first. While Donovan is on his way over the my mother’s house, I go out on this snowy night alone and purchase a tree which I struggle to get standing upright in its metal holder. When I’m ready to decorate the tree, I open the box Donovan has brought and discover that he did not bring the Christmas lights. He brought the wrong box. I tip over the edge. I yell at Donovan, “Why didn’t you bring the lights? I told you to bring the lights!” I’m hysterical. I start sobbing. And then I hear the sounds of a walker methodically bump-bumping toward the living room. My mother’s coming out from her back bedroom to see what is the matter. I can’t stand it. The last thing in the world I want is to have to deal with my mother’s upset on top of my own distress. When I broke down in her house two years ago, her response was to want to call 911. She thought I must have been having a heart attack; I was, but not the physical kind. My mother can’t deal with emotions, and, really, I don’t want to scare her further. So I duck into the kitchen and close the door. Then I hear the thump-thump of her walker coming toward the kitchen. I race out the other kitchen door and go back to the living room. She thump-thumps her way to the living room, and I just stand there, frozen now like a deer in headlights. My old mother trundles her walker over to the couch, lets herself fall to sitting, and with a kind but authoritative gesture, motions me to sit down beside her. I obey. She puts her arms around me and pulls my head onto her bony shoulder. I let go, falling into her frail body, weeping. She’s very rarely spoken to me about Pamela. I’ve also been reluctant to talk with her about Pam, because years ago I heard only judgments and criticisms from my mother both about Pam and about my mothering. But I know my mother has mellowed because recently she told me, “She’s my granddaughter and I love her. She’s sick and I hope she gets well.” I had felt a rush of gratitude for her having arrived at this simple humane expression of her concern. My mother adds, “I don’t know how you stand the pain. You’re so strong. I love you so much.” Her words astonish and soothe. I relax further and let myself be held in a way that I may never have been held by her, at least not since I was a small child with a bleeding skinned knee. Whatever remnants of bitterness I might have been holding onto for all of my sixty-three years—about my mother not having held me enough as a child—now melt completely. The crying quiets and we are just there, woman to woman, bearing together what I no longer have to bear alone. I am saturated by the love flowing between us. É véspera de Natal—um dia com neve, úmido e frio. Sinto uma terrível saudade de Pam. O Natal sempre foi uma época de proximidade em nossa família. Não importa o que mais estivesse acontecendo, Pam costumava estar próxima de nós nessa data especial. Nesta noite, estou determinada a vivenciar um pouco do espírito natalino com o que resta de minha família. Estou em casa da minha mãe, mas nem minha mãe nem meu marido parecem se importar em ter uma árvore de Natal, mas eu quero. Pedi a Donovan para trazer de nossa casa algumas decorações natalinas, incluindo luzes para enfeitar a árvore. Saio sozinha à noite na neve para comprar uma árvore, com a qual travo uma verdadeira luta para mantê-la de pé e encaixada na base metálica. Quando estou prestes a enfeitá-la, abro a caixa que Donovan trouxera e percebo que não havia luzes decorativas. Ele trouxe a caixa errada. Chego ao limite. Grito com Donovan, “Por que você não trouxe as luzes? Pedi para trazer as luzes!”. Estou histérica e começo a soluçar. Logo após, ouço os sons de um andador metodicamente estalando em direção à sala de estar. Minha mãe está vindo de seu quarto, para ver o que está acontecendo. A última coisa com que quero lidar agora é aborrecer minha mãe com minhas angústias pessoais. Quando cheguei descontrolada em sua casa, dois anos atrás, sua reação foi querer chamar o serviço de emergência. Ela não consegue lidar com emoções e, com certeza, não quero assustá-la. Então fujo para a cozinha e fecho a porta. Logo em seguida, ouço o tique-taque de seu andador vindo em minha direção. Corro em direção à outra porta da cozinha e volto à sala de estar. Ela retoma seu caminho para a sala e acabo parada ali, congelada como um cervo que se vê acuado pelas luzes de um veículo. Minha velha mãe gira seu andador em direção ao sofá, senta-se e com um gesto gentil, mas impositivo, pede para sentar-me ao seu lado. Obedeço. Ela coloca seus braços ao meu redor e puxa minha cabeça sobre seu ombro emagrecido. Entrego-me, e recosto-me sobre seu corpo frágil, chorando. Minha mãe acrescenta, “Não sei como aguenta essa dor. Você é muito forte. Amo muito você.” Suas palavras surpreendem e confortam. Relaxo ainda mais e me deixo ser amparada, de uma maneira que talvez nunca tenha sido antes, ao menos desde que era uma menininha com o joelho esfolado. Qualquer amargura remanescente, com a qual pudesse ainda estar apegada nesses meus sessenta e três anos de idade, agora se dissolve completamente. Welcome to the blog for Love Unbroken. On this blog Pamela and I will respond to questions and comments that you send to us via the Contact page. Before you contact us, however, we ask that you first read our book. That way we will have a common ground for discussion. If you are so inclined, we recommend that you also complete the Study Guide of Questions for each chapter for yourself. That way you will deepen your response to the book by probing your own experience of trauma and disappointment, as well as your own spiritual openings. Then we will have even more common ground for discussion. So, let us know what is on your minds via sending in questions or comments on contact page, and we will then respond via this blog. Happy reading!